"Seinfeld" had "The Contest," and on Wednesday night, we had the 21st century, more family-friendly version of that on "Modern Family." Claire challenged the Dunphys to go "Amish," as Phil put it, and give up all electronic devices. Luke was the first to crack, because he's "not made of stone," then Alex, for school reasons, of course (old encyclopedias aren't much help with cytoplasm and protoplasm). Surprisingly, and hilariously, Claire was out next, caught cheating by logging on to get plane tickets. The automated, voice-activated phone number she used was maddening (who hasn't been there?). Leave it to Haley, the most gadget-addicted of them all to pull a fast one when a car is at stake. Claire was shocked: “She carved a phone out of a bar of soap!" Phil's response: "Holy crap, we've been Shawshanked." Meanwhile, Mitchell and Cam were in a panic over the fact that Lily had yet to be enrolled in a prestigious preschool. Then they found out that they were supposedly a slam dunk to get in. As a receptionist at one school put it, "You’re diverse times three – you’re like Jimmy Buffett tickets to these hybrid-driving straight white folks." When they aimed high, going for the "Harvard" of preschools, they got spooked by the competition: "Disabled interracial lesbians with an African kicker?” said Cam. “I did not see that coming,” said Mitchell. So, their interview was a total disaster, involving Cam pretending to be 1/16 Cherokee, and Mitchell asking if he could interview again as a single parent. Lastly, we had Jay and Manny dealing with the spectre of Gloria having killed the neighbor's constantly-barking dog (he had responded by saying he never complained about their squawking parrot, a.k.a. Gloria). To the relief of Jay, Manny and PETA, Gloria -who once chopped off a rat's head and left it as a warning to the other rats - merely stole the dog. When Jay reminded her that that is illegal in the U.S., Gloria sarcastically replied, "In Colombia, we trip over goats and kill people in the streets. Do you know how offensive that is? Like we're Peruvians?" This week, all three plots were equally strong, but I have to admit, I'm really looking forward to next week's Halloween episode even more. What about you? Post a video or comment below. In the meantime, check out iReporters Nadya Alvarez and Kathi Cordsen, who shared their take. Next entry »Wedding bells this weekend for Brand and Perry? Get a life. This show is for people with some degree of intelligence. Obviously the ones who felt insulted don't have the brains to understand the satire and humor in the show. We all know it was intended to be a joke, but it was not funny at all. I'm sure if the joke would've been about Gay people, Mexicans, or Cubans, these communities would have already been all over their case, but since they think Peruvians are not going to do anything about it, they think they can get away with it :(. Good Job ABC, keep making money with ignorant, racist, and prejudice shows like these! IT WAS A JOKE. And a funny joke. I'm Peruvian and I laughed out loud. It doesn't make me any less Peruvian, or any less proud of my country – it just means I understand the concept of humor. The Peruvians who are up in arms about this are making us all look petty and easily insulted – my family, Peruvians all of us, enjoy a good laugh. These people need to get a life and learn the difference between TV and reality. Please. Get a life. All of you. I'm American, so maybe I'm missing something here, but the line was meant to be funny! A Columbian saying that Peru is more violent and backward then Columbia is a matter of laughs. The whole world knows that Columbia is the most violent country in the world people! Calm down. I agree, the District of Columbia is filled with criminals. I'm offended! I'm a Peruvian and I haven't tripped over any livestock in WEEKS. Stop this discrimination. I mean, what are we, the Dutch?? Clearly, the writers of this show are ignorant to say something that is so far from the truth about Peru. If anything, that comment is more true about other countries in South America (you know Colombia has a lot of terrorism and drug dealing issues, right? ), than it is about Peru. I find it sad that this show had to insult my country to get a few laughs and rating points – how pathetic! They should be taken off air because they have clearly ran out of good jokes and ideas. Obviously, I will never watch this show again and never respect Sofia Vergara again who should have refused to make fun of a neighboring country. Aww, you're not going to watch anymore? That's too bad. I hope ABC can deal with losing you as a viewer. Really, what a tragedy. I can't believe everyone is making such a big deal out of this. If you have a little brain you would realize that the show actually mocks those kind of generalizations. Sofia's character (some seem to be confused, actually accusing the actress – you know, Gloria is not a real person) has made so many similar remarks about Colombia. I think it was extremely funny and love the fact that they have the balls to make jokes like that. I am peruvian, I love the show and think it is the smartest humor there is on TV today. I am Peruvian and I found that hilarious. That joke is making fun of the whole World. It is sarcastic and ironic, and very smart too. She gets all offended because her husband made an offensive comment about "her" country/people, and then she just turns around and makes the very same comment about another place. It is genius because it is true; everybody does that in real life. She could have used the name of any other country in the World; however, being that she is Latin, it wouldn't be as offensive if she joked about one of their own. It is pretty much telling someone that they shouldn't do something because it is wrong, and then doing it yourself. We even have a saying for that in Spanish: "Ver la paja en el ojo ajeno, pero no la rama en el propio" (please someone else translate that because I have no clue how to say it in English). Dear Allan: Me alegra mucho que encontrar un peruano sin complejos!!! Yeah but you didnt knew what she said on twitter sofia vergara.. If I would like to make a "repechaje" my dear Allan, I would have said: Oh yes, here we go, as in Colombia we do (this) and in US you guys go directly toi the point, just declare war 😀 isnt's this funny??? Funny? obviously these scripwriters have not creativity at all and are a bunch of morons. Sofia is also contradicting herself when she say is proud to be Latina, but on the other hand trashing and insculting her own culture. THAT WAS OFFENSIVE! In Peru, we do not trip over goats!!! WE TRIP OVER LLAMAS!!! PLUS lets not forget the show is SCRIPTED. Instead of being "MAD" because they used the word "peruvian" lets be proud our south american brothers and sisters are finding success in a white-dominated industry. what kind of peruvian are you??? How can you find hilarous her offensive words!!.... I dont think peruvians need an stupid, brainless actress "help" them to be famous with such a comment. That show is over for me. She can keep making fun of herself with that horrible accent. I don't care anymore.... and by the way... I don't think you're peruvian...not at all !!! That was VERY offensive! I am glad to hear that authorities in Peru are looking for an apology for what was said about Peruvians. Peru, as someone else said before, is a GORGEOUS country! Colombia can only dream of having something like Machu Picchu or the Nazca Lines or the churches full of gold decorations, ETC. But, this is not about getting Colombia back for what Sofia said... I am sure they felt embarrassed when one of their people read that offensive line. Peru deserves an apology on TV! Put down the remote – that's TV. There you go. Now look outside – that's right. That's real life. You see? You see the difference? Sofia I took for granted that you had common sense and brains. Being latina you should have known that your line would be offensive, How do we know that? Because you played the offended one when your TV husband harangued you about Colombia's troubles. You could have said something to the sriptwriter but who cares the mighty dollar rules even if it means offending other cultures. This show is over for many people... The Peruvian comment wasn't funny at all and probably would be funny for ignorant people that do not know anything about Peru. Peru is a beautiful modern country with friendly educated people. Yes, wonderful places not counting that they posses Machupichu that is one the 7 Wonders of the World. Also, recently ranked Top 1 Best Airport in South America, Best coffee of the World 2010, and the Nobel Prize in Literature 2010 was awarded to a Peruvian writer...etc etc. Let's face it violence exists everywhere but if we compare Peru with other countries statistically is not as much. Sofia Vergara would not be respected after this especially within the Latin American community for being the stupid puppet that degraded and as Hispanic herself her own people. She could have told the producers that it wasn't the right thing to do (discriminatory, insulting, offensive to a specific culture or country) but still did it for the sake of some money. This shows her lack of brightness, dignity and character even if she is only an actress in the show. I used to love this show, but I find really offensive what Gloria says about Peru, I think if you want to make laugh it is unnecessary to insult other people. This show is over for me, and all the people I know. I am posting this stupid phrase on my Fb and Twitter so everyone knows about it... retards..
"In Colombia, we trip over goats and kill people in the streets. Do you know how offensive that is? Like we're Peruvians?" think it's the first bad episode. 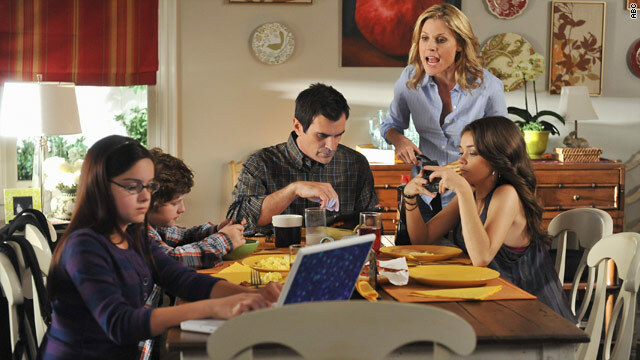 Modern Family is easily in my top 3 favorite shows on TV only behind The Office and Law and Order SVU. I don't know where they come up with this stuff but I'm urging them to KEEP IT COMING! Modern Family is such a funny show. Cam is the funniest. His timing is perfect. Funny, funny stuff. i can relate to each family sect. The gay couple, hispanic female, and family with many siblings and cooky parents. I just couldn't imagine to write such funny intelligent stories and pick the best actors to play those exaggerated roles out! Favorite line,"leave it to the gays to raise the only under-achieveing asian child" (or something to that effect.) If ever you want to tell friends and family to watch the show, if they don't follow it, this weeks episode should definitely be the one to watch. Funny stuff! I don't know what was funnier...Cam and Mitchell distmayed over being out gayed, or a screeching Gloria setting off the car alarm. Hopefully Cam will be over in over the top mode for the halloween show. And the award for funniest character of the night goes to...GLORIA!